Respected Chairman, Revered Elders, Honoured Guests, Dear Sisters, Dear Brothers! 125 years ago, in the remote and undistinguished town of Ludhiana, India, a simple and modest event took place. It was an event which was devoid of pomp or circumstance; an event which went unreported in the chronicles and periodicals of its time. The Reformer, commissioned by Allah, the Almighty, as the Promised Messiah of the Latter Days, took the Covenant of Allegiance from just forty devotees and with that he laid the foundation of the Ahmadiyya Muslim Community. With impeccable confidence in Divine assurances and the prophecies of the Holy Prophet (saw), the Promised Messiah (as) was convinced that the Mission he was inaugurating that day would initiate a worldwide movement of change. And it did. The naysayer was flabbergasted, the doubter bewildered and the cynic dumbfounded! 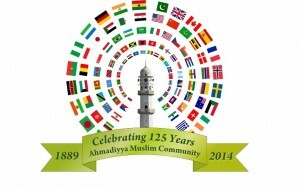 Today, 125 years later, we celebrate the success of the Ahmadiyya Muslim Community, the propagation of its message to the ends of the earth; its exponential growth in the face of bitter opposition and sustained persecution; its establishment in every continent and in over 200 countries of the world; its unique organisation, structure and dynamism; its unparalleled services to Islam and humanity. Today, we celebrate 125 years of astonishing progress, phenomenal achievements, countless blessings, innumerable prophetic fulfilments and manifest Divine support for the Ahmadiyya Muslim Community at each twist of the kaleidoscope. Today, it is the burden of my half hour speech to review the 125-year remarkable and glorious history of the Ahmadiyya Muslim Community. Respected Chairman, Distinguished Audience! The Promised Messiah, Hadhrat Mirza Ghulam Ahmad (as) of Qadian, was a faithful servant of Allah and a devoted follower of the Holy Prophet (saw). Appointed by Allah as the Reformer of this age and for the advocacy of Islam, he is the Messiah foretold in the Traditions of the Holy Prophet (saw) and the Mahdi promised in his Sayings. By his work, message and example, he propelled Islam into the public consciousness and demonstrated its superiority over other religions so that the Holy Prophet (saw) could be accepted as the Seal of the Prophets by all the peoples of the world. Under Divine instructions, he founded the Ahmadiyya Muslim Community in 1889 for the unification of mankind under the banner of Islam and for the final, universal manifestation of the Unity of God. At a time when obscurantism and bigotry had become the hallmark of Muslim thinking, he revived true Islam and restored it to its pristine purity, divesting it of all false appurtenances which had, over many centuries, adulterated its teachings. No longer would any verse of the Holy Qur’an be considered abrogated by other verses; no longer would the concept of Jihad be synonymous with an armed struggle to establish an Islamic dominion; no longer would the Prophet Jesus (as) be considered to be alive in heaven from whence he will descend to renew Islam. Within a few years of the inauguration of the Community, the most astounding heavenly testimony of his truth was manifested in the form of the lunar and solar eclipses both in the same month of Ramadhan exactly as had been prophesied and prophesied categorically centuries earlier by the Holy Prophet (saw). It was during his lifetime that this Annual Convention or Jalsa Salana was instituted and The Review of Religions, the world’s longest running Muslim magazine in English, was launched. To initiate a truly New World Order, an Order not of man but of Heaven, he inaugurated the Wasiyyat scheme for the relief of poverty and distress and for the service of mankind. And towards the close of his life, he consolidated the administration of a now growing, varied and extensive Movement into the Sadr Anjuman Ahmadiyya or Central Ahmadiyya Association. With the success of the Movement came opposition, hostility and persecution. The first two martyrs – Hadhrat Abdur Rahman and Hadhrat Sahibzada Abdul Latif (ra) – laid down their lives with utmost and enviable steadfastness. There were to be scores of other martyrs in the years to come. Yet the progress of the Movement would never be arrested. The Community continued to grow in stature and strength so that by the time of the demise of the Promised Messiah (as) in 1908, his message, initially received with laughter, scorn and ridicule, had been accepted by hundreds of thousands. He bequeathed the Community a spiritual treasury of literature he had written including the peerless and matchless scholarly treatise entitled The Philosophy of the Teachings of Islam which was read out at the Conference of Great Religions and which continues to inspire readers to this day. Despite such accolades, however, his unthinking opponents rejoiced in his death hoping that what they considered a grave heresy would now die a natural death and be relegated to history. For the members of the Community, notwithstanding numerous prophesies warning of his end, the impact of his demise was devastating and shattering. At that critical hour, his most devoted follower was unanimously elected to the office of Khalifatul Masih, that is, Successor to the Messiah. By the grace of Allah, in that capacity he steered the ship of Ahmadiyyat to safe waters fully safeguarding it from disintegration. Thus was to begin the singular, glorious and blessed institution of Khilafat in Ahmadiyyat, that is, the Ahmadiyya Caliphate, which, more than a century later, continues to spearhead an Islamic renaissance, drawing strength from an abiding belief in God, a noble objective of uniting the whole world under the standard of Islam through love, logic and persuasion, and a relentless passion to serve humanity the world over. Hadhrat Maulana Nuruddin (ra), the first Khalifa, was an eminent divine, a reputed physician, a discerning mystic and a scholastic commentator on the Holy Qur’an. By devoting himself to the exposition of the vast treasury of spiritual verities comprehended in the Holy Qur’an, he proved himself a worthy Successor to the Promised Messiah (as), whose primary purpose was to establish the supremacy of Islam through the exposition of true Islamic values and their illustration in practice. During his Caliphate, the edifice of the Community began to take shape upon the solid foundations laid by the Promised Messiah (as). Projects that were pending or contemplated at the time of the demise of the Promised Messiah (as) were immediately taken up. The Madrassah Ahmadiyya, a theological seminary conceived by the Promised Messiah (as) for the religious instruction of scholars to be entrusted with the sacred task of conveying the message of the Movement globally, was established. In response to the growing financial requirements of the Community the Baitul Maal or Treasury charged with the responsibility of collecting funds and donations was instituted. The popular Al-Fazl newspaper that was to spread all over the world and become the official daily organ of the Community began to be published. It was also during this glorious era that the very first foreign mission outside India was established here in the UK in 1913 and with that the fulfilment of Divine prophesies relating to the global spread of Ahmadiyyat began to materialise. However, the most important distinction of the first Caliphate was its instrumentality in safeguarding and fortifying the very Institution of Khilafat. This single most important factor needs to be reiterated and re-emphasised so that posterity is left in no doubt as to its significance. Although unanimously elected, the First Khalifa soon faced persistent opposition from prominent members of the Community who, carried away by their academic qualifications and positions of honour, sought to usurp the authority of Khilafat and render it merely symbolic. 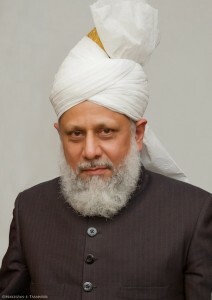 The firmness and far-sightedness of the Khalifa, his courageous and valiant defence of the institution of Khilafat and the upholding of its dignity and authority in the circumstances in which he was confronted, openly and in secret, was truly a manifestation of Divine support for him and for the Community. Had he succumbed, the Movement would have been plunged into turmoil and the history we recount today would have remained but a distant illusion. 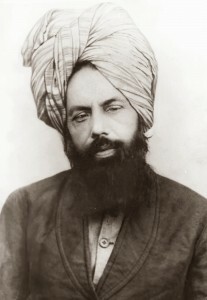 However, the seed planted by the Promised Messiah (as) was to grow and flourish beyond the wildest imaginations of his enemies under the fostering care of his First Successor who neither shirked nor evaded the question of status and authority of Khilafat, nor yielded a single inch of ground under overt and covert challenges. We remain indebted to him for establishing the Ahmadiyya Caliphate on a firm footing. On the demise of the First Khalifa in 1914, the robe of Khilafat was bestowed upon Hadhrat Mirza Bashiruddin Mahmud Ahmad (ra), the Promised Son of the Promised Messiah (as), whose birth was in fulfilment of a glorious prophecy of the Promised Messiah (as) that he would be granted a son whose qualities and excellence would be truly outstanding. Elected to the exalted office of Khalifatul Masih at the tender age of 25, his Caliphate, spanning a staggering fifty-two years, truly represents a golden era in the history of Ahmadiyyat during which the Community came of age as it were. If, following the shock and impact of the demise of the Promised Messiah (as), the focus during the first Khilafat was on consolidation then the focus during the second Khilafat most definitely was on expansion. With extremely limited funds, the Community advanced to previously unfathomable heights, maintaining the highest level of activity, both in respect of self-improvement and in respect of propagating its message to distant lands. Notable among the numerous schemes launched during this era are the Tahrik-e-Jadid and Waqf-e-Jadid schemes which have been instrumental in establishing the Community in almost every country and under which thousands of schools, clinics, hospitals, mosques and mission houses dedicated to the service of Islam have been established around the world. It was also during this period that the Holy Qur’an was translated into various languages of the world so that the glory and wisdom of the Divine book could be available to many in their own languages. The Madrassah Ahmadiyya was raised to the status of Jamia Ahmadiyya, an elite theological seminary, which has produced thousands of the finest scholars and missionaries of Islam to further the mission of the Promised Messiah (as). It was, of course, during this glorious period that the auxiliary associations were launched – Lajna Imaillah for the ladies, Majlis Khuddamul Ahmadiyya for the youth, Majlis Ansarullah for the elders and also Majlis Atfalul Ahmadiyya and Nasiratul Ahmadiyya for younger boys and girls. Today, under the auspices of their particular association, all members of the Community are bound together in affectionate ties of brotherhood and sisterhood and carry out programs designed to inculcate moral and spiritual values. The Community was to face great challenges during this period also in the form of anti-Ahmadiyya disturbances in India in 1934 and later nationwide anti-Ahmadiyya riots across Pakistan in 1953 both of which threatened the very existence of the Community. In between those two great trials was the enforced migration of the Community en masse to Pakistan after the 1947 partition of the Indian subcontinent from where the whole city of Rabwah comprising new Headquarters for the Community was started from absolute scratch in a most inhospitable and barren land. Throughout all these tribulations, evidence of Divine support and succour is retrospectively perceptible. Not only was the dignity and honour of the Community fully upheld and safeguarded, it continually made progress with many members joining its fold far more than before. 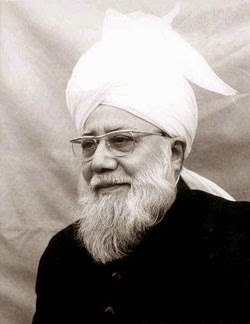 When the Second Khalifa passed away in 1965, Hadhrat Mirza Nasir Ahmad(ru) was elected as Khalifatul Masih III. During the seventeen years of his Caliphate, with his unique administrative ability and his distinctive plans of far-reaching benefits, he was able to further strengthen and expand the Community. Some of the salient features of this era include the establishment of the Fazle Umar Foundation to promote activities in the fields of research work, education, missionary engagements and economic welfare; the inauguration of the Khilafat Library in Rabwah which now accommodates over 50,000 books, magazines and journals and has become a treasury of knowledge for readers and research scholars; and the historic return of Islam to Spain after a lapse of 700 years through the efforts of the Community. It was also during this period that the blessed Nusrat Jehan Scheme was conceived under Divine guidance through which scores of schools and hospitals, operating purely for the service of humanity without any profit-making motives whatsoever, were established in Africa. 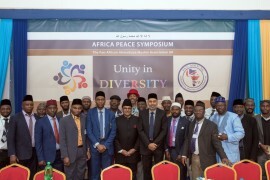 It is through the success of this scheme Ahmadiyya became a household name in many parts of Africa. 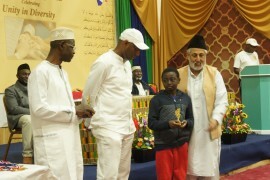 As Dr Ernest Bai Koroma, President of the Republic of Sierra Leone says, “in many parts of our land Ahmadiyya is a byword for school, education and learning.” It is indeed through the success of the Nusrat Jehan scheme that millions of Africans embraced Ahmadiyyat and still continue to do so. The Community was now progressing in leaps and bounds and its membership numbered over ten million. With such outstanding progress, persecution intensified and even became state sponsored when, in 1974, the government of Pakistan, colluded with extremist elements within the country to declare Ahmadis in their own words as “non-Muslim for the purposes of the Constitution or the law.” A wave of severe anti-Ahmadiyya hostilities at once swept through Pakistan during which a number of Ahmadi Muslims were killed, maimed or injured, and there was large-scale looting and destruction of properties. Under the guidance of its Khalifa, not only did the Community set a remarkable example of steadfastness and self-restraint enduring all the outrages with forbearance and fortitude, it went on, in this very Caliphate, to adopt the slogan: Love for All, Hatred for None. This simple yet consummate phrase was to become a lasting testament to the conduct of Ahmadi Muslims so much so that, in addition to the Kalima, it became the established motto of the Community. 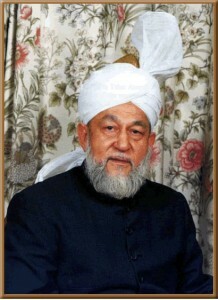 After the demise of the Third Khalifa in 1982, Hadhrat Mirza Tahir Ahmad (ru) was elected as Khalifatul Masih IV. He was a fearless champion of Islam who put the Community on the road to worldwide spiritual triumph with masterly swiftness. Whoever met him could not fail to feel they were in the presence of greatness. His aura was truly indescribable. His leadership was distinguished by dynamism and charisma that became the hallmark of his twenty-one year Caliphate during which the Community witnessed a period of great change and outstanding success in a wide variety of fields and saw its membership grow to tens of millions worldwide. He, like his predecessors, under Divine direction, launched various schemes to mobilise the Community’s efforts for the global spread of Islam. Recognising the spiritual needs of the millions who were to join the Community, he founded the Waqf-e-Nau Scheme and called on parents to dedicate their future offspring to the service of the Community. Large numbers responded to the call of their Khalifa and the foundations were laid for future missionaries. Thousands of mosques, mission houses, clinics, hospitals, schools and colleges consecrated to the service of Islam were further established worldwide. Homeopathic dispensaries were set up all over the world providing millions with cures to various ailments free of charge. The Holy Qur’an was further translated into diverse languages of the world. During this period also the Community passed through extremely traumatic times. The military dictatorship in Pakistan aligned itself with orthodox Muslim clergy to impose fundamental and extreme laws in an infamous Ordinance which meant Ahmadi Muslims could no longer profess their faith. Persecution and oppression of Ahmadis intensified. They were murdered in cold blood, Ahmadi mosques were demolished or desecrated and even the graves of Ahmadi Muslims were defiled. t became impossible for the Khalifa to reside in Pakistan and he was forced to migrate to the UK. The story of his migration is one of the most remarkable chapters in the history of the Community. If ever proof was needed to show the truth of Ahmadiyyat, the manner of the Khalifa’s departure from Pakistan right under the clutches of a military dictator with all the worldly might at his disposal demonstrated the succour which Allah gives to the Community. The tremendous progress made by the Community in the years that followed again can only be attributable to special Divine providence for the Community. It was from the UK that Community set up Humanity First, an international charity organisation, which has achieved UN recognition status for its worldwide disaster relief action and work in serving the needs of mankind, irrespective of colour or creed. It was also from the UK that the world’s first and groundbreaking global Muslim satellite broadcasting channel, MTA – Muslim Television Ahmadiyya – through which millions worldwide are watching these proceedings was launched. The authorities in Pakistan had sought to silence the Khalifa and to ban the promotion of the message of the Promised Messiah (as) within Pakistan but now the voice of the Khalifa and message of the Promised Messiah (as) was beamed from the heavens into their houses, daily and round the clock not only in Pakistan but throughout the world. This is emphatic testament of the crushing defeat suffered by the opponents of the Community. As everyone knows, today we are going through the blessed and historical epoch of the Fifth Caliphate under the headship of His Holiness, Hadhrat Mirza Masroor Ahmad who, following the demise of the Fourth Khalifa in 2003, was elevated to the office of Khilafat. He is the uniting force of the global Ahmadiyya Muslim Community and through his blessed leadership and engagement with world leaders, he has continued to develop, expand and consolidate the position of Ahmadiyyat in the world. His Holiness is a great reformist whose sermons incite the members of the Community to climb moral and spiritual heights. 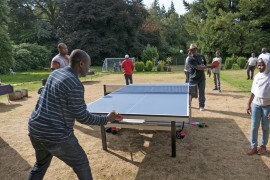 He has travelled extensively to visit members of the Community throughout the world. To fulfil the needs of the ever growing Community, he inaugurated MTA Al Arabiyya focused on broadcasting the message of Ahmadiyyat to the Arab world. There has been a proliferation in the number of new mosques built by the Community including the largest mosques in Western Europe and North America, taking the total number of mosques now built by the Community to over 17,000 worldwide. That is in addition to nearly 700 schools and over 40 hospitals worldwide and translations of the Holy Qur’an into over 70 languages of the world. To restore the rightful contribution religion has to offer in the 21st Century, under the leadership of His Holiness, the Community organised an historic Conference of World Religions at London’s Guildhall which provided international faith leaders with a unique platform to bring to the fore the distinctive contribution that faith can make in the world today. As with the previous Caliphates, during this era also the Community has faced real and grave challenges. Persecution reached new bounds in 2010 when armed extremists simultaneously stormed two Ahmadi mosques in Lahore, Pakistan, and opened fire upon unarmed worshippers as they were engaged in Friday Prayers. Nearly 100 were brutally martyred within the sacred walls of a mosque on that day and targeted killings of innocent Ahmadi Muslims has continued on an increasingly frequent basis. Yet the reaction of the Community, under the guidance of its Khalifa, is one of non-violence, patience and prayer. It is this response that has won our Beloved Khalifa the title of “A Man of Peace”. Wherever he goes, leaders of nations seek his advice, guidance and prayers. Deeply troubled by growing international tensions, he has written to Heads of State of major countries urging them to inculcate a true sense of justice and peace in international relations. He has delivered historic addresses at the New Zealand National Parliament, the UK House of Commons, the European Parliament and at Capitol Hill in Washington, DC. Respected Chairman, Dear Sisters and Brothers! This was but a brief recollection of the 125 history of Ahmadiyyat. This is the remarkable story of a Community that, in the face of some of the most intense and sustained religious persecution the world has ever known, responded with resignation and patience, with steadfastness and endurance, and with undisturbed and serene humility, to establish spiritual colonies throughout the world, transforming barren deserts into blooming gardens. This is the remarkable story of a Community whose Islamic status is not recognised by other Muslims – denounced and ex-communicated – and yet has continued to sacrifice life, wealth, time and honour on a global scale for the glory and propagation of Islam and for the promotion of a value system founded in the service of humanity, rooted in the call of duty and inspired by the love of God; a value system which champions non-violence, urges moderation, espouses tolerance, condemns extremism, promotes peace, pursues justice, supports human rights, upholds universal brotherhood, advocates religious freedom, encourages interfaith dialogue, sponsors charitable endeavours, endorses the law of the land, demonstrates loyalty to country and nation, works to secure the common good, calls for the education of women, defends the dignity of mankind, inculcates love for all and discountenances hatred in every guise. More than anything else this is the remarkable story of a humble servant of the Gracious God who, at a time barely known in his own village, claimed he had received revelation from God appointing him as the voice articulate of this historical epoch – revelations which predicted the acceptance of his teachings by the whole world. In spite of all difficulties and opposition, he arose and thundered like a cloud. Jealous and hostile eyes looked on. But, to their discomfort and dismay, the cloud spread over the whole sky and it rained not just over Qadian but over the whole of India. What is more, it rained over the dominions of Europe and over the tropics of Africa; it rained over the deserts of the Middle East and over the terrains of the Far East, it rained over the constituencies of North America and over the contours of South America; it rained over the landscape of Asia and over the landmasses of Australasia; it rained over continental islands and over tropical islands; it rained over every continent of the world. There is not a community in the world that has not yielded followers to him. There is not a mainstream religion of the world that has not yielded followers to him. Who can now doubt the Divine origin of that glorious revelation from the Lord of mankind to His Promised Messiah (as): ‘I shall carry thy message to the ends of the earth’; a prophecy made from the remote hamlet of Qadian that was, at the time, not accessible by metalled road, located 11 miles from the nearest railway station and 35 miles from the nearest printing press; a prophecy made at the time when he lacked the means of conveying his message within the province in which Qadian is situated let alone throughout Indian and beyond. Yet today his message has been conveyed to the ends of the earth and branches of the Community are strung around the globe. Today Ahmadiyyat stands established in 206 countries of the world and its pace is destined to engulf the whole of mankind. The prophecy found magnificent fulfilment against all odds. Let the 125-year history of Ahmadiyyat send a categorical message to all opponents and hostile fanatics that all their efforts will fail and fail utterly to arrest the progress of the Community. The success of Ahmadiyyat under the Divine leadership of the Ahmadiyya Caliphate is guaranteed. No man or woman, no earthly power or military machine, no Trojan horse or force of nature can derail its momentum or delay its destiny. Ahmadiyyat is a caravan that will most certainly arrive! Therefore, O ye devotees of the Promised Messiah (as), as we review the 125-year history of our Community let us do so keeping in mind the exalted station of Hadhrat Mirza Ghulam Ahmad of Qadian (as), that grand spiritual son of the Holy Prophet (saw); let us do so keeping in mind our faith in him as the Promised Messiah, Imam Mahdi and Latter Day Prophet; let us do so keeping in mind that all progress made by the Community after him has through the blessing and instrumentality of the only true and Divinely-instituted Caliphate in the world today, that is, the Ahmadiyya Caliphate. Congealed by the truth of our faith, bonded by the love of our beloved Master, Hadhrat Aqdas Muhammad Mustafa (saw), cemented to our unhindered belief in the Promised Messiah (as) and united at the hand of our Divinely-guided Khalifa, let us cross borders to spread Ahmadiyyat – the Islam of peace, Ahmadiyyat – the Islam of justice and Ahmadiyyat – the Islam of truth. We must not only review our history today; we must also rededicate ourselves for the future. A future in which the flag of Islam will fly higher in the world; a future in which the torch of Ahmadiyyat will shine brighter in the world; a future of enlightenment, salvation and success. May Allah make it so and bless you all profoundly. Ameen. Respected Chairman, Revered Elders, Dear Sisters and Brothers! Thanks for having me. Wassalamu Alaikum.